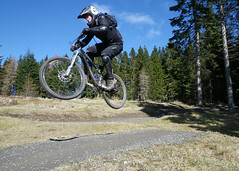 On 11th April, the IMBRC will host the first round of the 2010 XC NPS in Slade Valley, Saggart. Slade Valley has hosted various XC events in the past including Leinster League and NPS races. The course is approximately 5km long incorporating 70% new singletrack. The start finish area will be in the field at the back of Slade. Chip timing on the day will be provided by www.chipit.ie. Timing will also be done using the MTB Commsions laptop & software. Parking on the day will be in a field on the west side of the woods. Access to the field is via a small road, so caution is advised when entering and exiting the venue. Please use the online sign on facility provided by the MTB Comission. Sign on will be available on the day up until 11:30. Underage races are free to enter. Cycling Ireland licences are Required. Day licences will be available on the day. Who ever is interested in travelling to this event on Sunday Register before Saturday and we can then sort out travelling arrangements.